This oddity was introduced from a lab as a mutated form of Alocasia portora a hybrid developed by LariAnn Gardner. 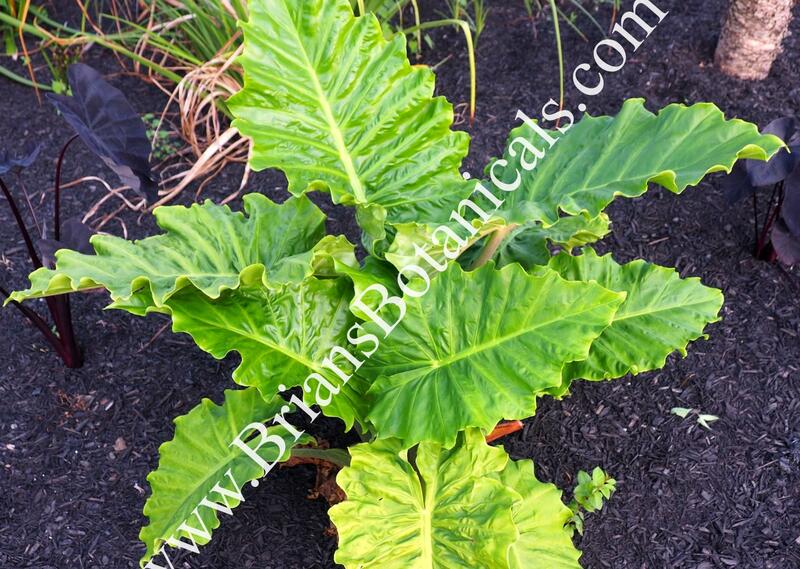 The origial Alocasia Portora is a huge growing plant with large rippled leaves and brown petioles. This mutation Alocasia Low Rider is a odd dwarf from that plant with bulky petioles and an over all squatty habit which makes it excellent for containers or as an almost boarder plant in tropical displays. Growing to 3 feet tall in a season it may grow larger with time and may even produce a trunk but over all in considered a dwarf to the original. Dark green foliage with rippled edges growing to 2 feet long and 1 foot wide. I was skeptical of growing this plant but after growing it out I find it can be very useful in the landscape and is just as easy and quick to grow as Alo. Portora.